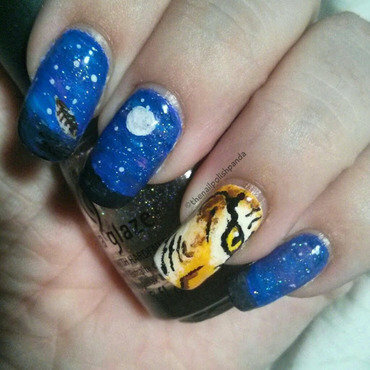 29 year old amateur nail polish and nail art enthusiast. Inspired by a lot of other much more talented artists out there. 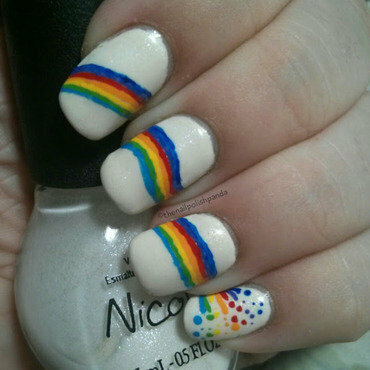 I did these for Pride month. Now, I'm not homosexual. I'm actually pansexual, and the colours for that flag are pink, blue and yellow. I hate working with yellow at the best of times, but in the wake of the tragedy in Florida, I went with an actual rainbow to stand in solidarity with the LGBTQIA+ community. Because screw fear, screw the violence. Love is love. If only people would open their eyes, their hearts and their minds. The rainbow is all acrylic paint. This was inspired by LifeWorldWomen on Youtube, but hers involved actual pieces of thread and it was done in greys. 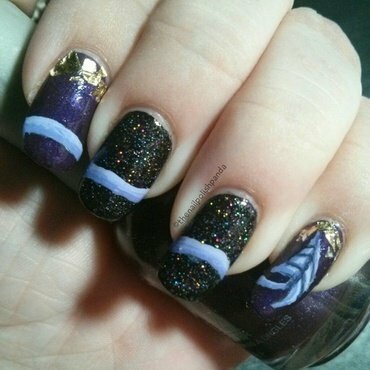 I also changed it by doing gold dots instead of silver and adding a piece of silver holo glitter instead of rhinestones since mine are garbage for nail art. If anyone can rec me some rhinestones that don't lose their sparkle, let me know. 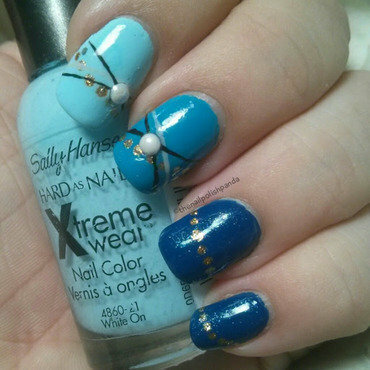 The stripes are acrylic paint and the half pearls are from Bornprettystore. This was inspired by a background picture I found on the Google images. I wanted to do some stamped white stars, but I couldn't get it to transfer into my stamper. Frustrating as hell. Also I do not like outlining clouds. Something that should be easy turned hard for me. I debated if I wanted to keep it glossy, but I actually like the way the glitter looks matte in this case. 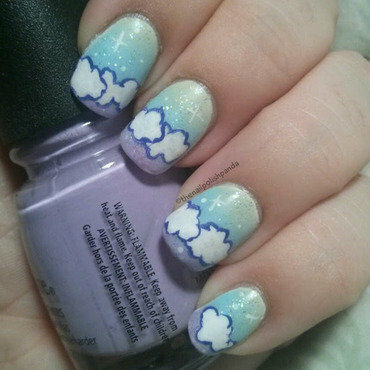 The clouds are acrylic paint. I did these for my sister's birthday. She likes cupcakes, I like rainbows. So cloud cupcakes with a rainbow. It was also the first time doing a smoosh marble. Kinda fun! But I need more practice. 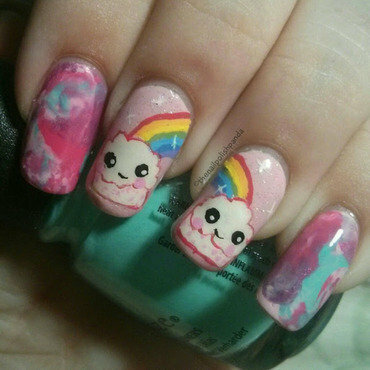 The rainbow and cupcakes are hand painted with acrylic paint. 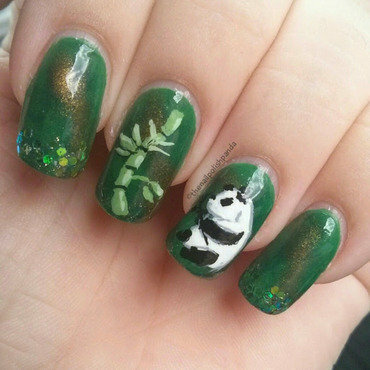 This was my mum's idea to do a panda design, and I used a Chinese painting as a reference for the panda itself. I like that the gold kinda makes it look like a tiger's eye stone. The panda and bamboo are hand painted in acrylic paint and the glitters are from Born Pretty Store. This was inspired by LifeWorldWomen on YouTube, which is nice coz I was mega uninspired. It's not a recreation really since I added a base colour and less white flowers. Also I changed the rose colours. 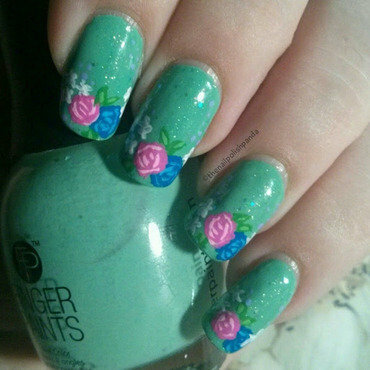 The flowers are all acrylic paint. First time doing nail stamping and I think it turned out pretty good. 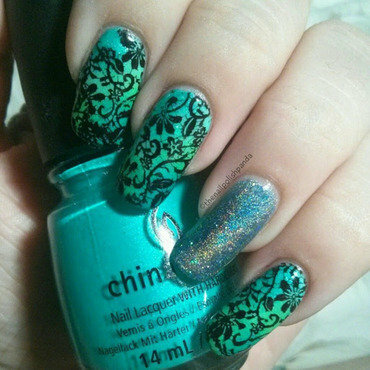 The holo accent is a sandwich of two colours for funsies and the gradient is a block gradient. This was inspired by a handmade card video I saw on YouTube by Darlene DeVries. I admit that I watch card making videos. They're oddly soothing. 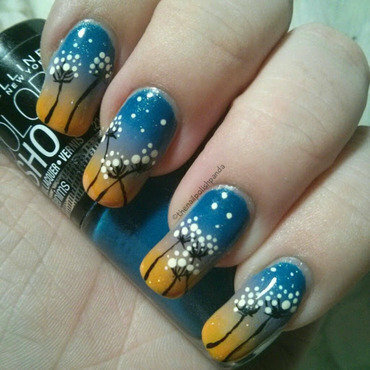 But this dandelion on an evening sky thing really inspired me for this, and it's a rare no accent nail art! Go me! 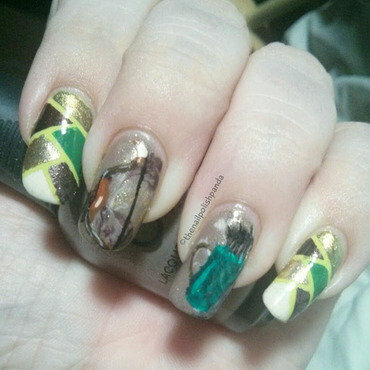 But while I was painting these, I stuck my fingers together several times on my Girly Bits liquid latex barrier. Lol it was an experience... The dandelions are acrylic paint. A game that isn't even finished yet has won my heart for how twisted and messed up it is. That game is Yandere Simulator, the story of a school girl destroying the love life of a guy she's obsessed with so she can have him. She eliminates her rivals by ANY means necessary. The game has an anime art style, which I used for the scared eye. It's also my first time painting letters on my nails. I got a bit cross-eyed. There is a shimmery red gradient on the black that shows up better in real life. 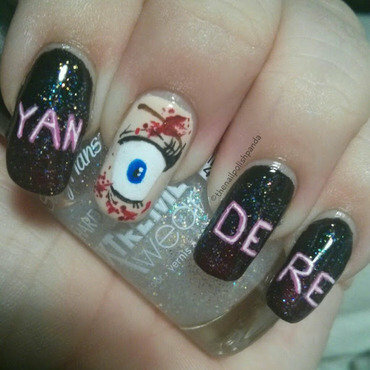 I also chose the glitter for how Yandere-chan presents herself as an innocent girl but has insanity underneath. Also the word yandere is a term that means love sick, and the term sick meaning insanity. 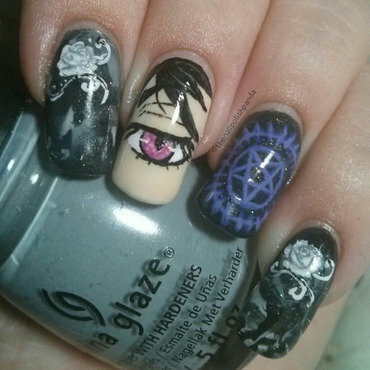 I actually sent this to Yanderedev himself and he emailed me back saying he'd never seen fanart done on nails before, and that it was a nice surprise to see. He also said it cheered him up and he thanked me for my, and I quote, "unique artwork". 😊 So, it has to be said... YANDEREDEV SENPAI NOTICED ME! The eye, blood and letters are acrylic paint. China Glaze Wood You Wanna? 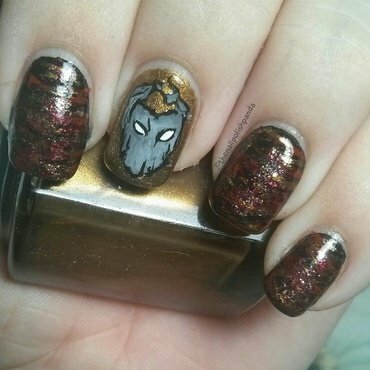 Part 2 of 4 for the D20 Babes nail art! This is for the tiefling bard Van Tyler played by the lovely @hello_dudettes! It gave me some trouble initially, since I tried to paint her horns with music behind them. The horns didn't work. Thankfully, the other defining characteristic of tieflings is their tails. Van also has sticky fingers when if comes to gold and other shinies, so I included some gold mylar flakes and lots of glitter. The dark purple base is for her hair. The tail is done in acrylic paint and I used nail glue to adhere the mylar. If you want to watch the ladies play, check them out at twitch.TV/d20babe at 7pm PST. Week 40 of the 52 week challenge is Inspired By Fiction. This counts. I've become a fan of the D20 Babes on Twitch rather recently, and I love all the characters played by the ladies and the work of their DM Kurtis Wiebe who is the author of Rat Queens. 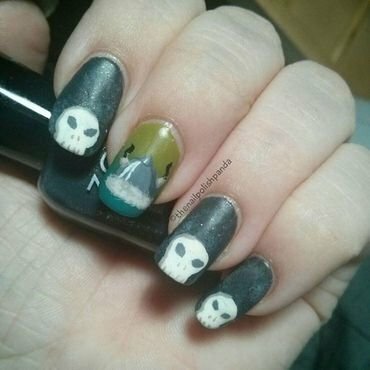 So I became inspired to do a mini nail art series dedicated to the four characters. This one is for Petunia, the gnome barbarian played by d20babe. The skull is from her necklace, and her helmet is on a gradient in her hair colour. The skulls and helmet are done in acrylic paint. I followed the art design done by the amazing Kit Buss. I'm extremely happy with how this turned out. If you love Dungeons and Dragons with awesome ladies, check them out on Mondays at 7pm PST on Twitch.TV/d20babe or on the their YouTube at the same name to watch the recorded episodes.